As 2011 finally draws to an end Richard, Dan and Iwan, the team behind E Shop Hosts, would like to thank all our clients for making the last 12 months special and to take the opportunity to wish you all a Happy and Prosperous 2012! Over the last twelve months E Shop Hosts have tried to maintain a service and product range that our client expect and appreciate, we have kept our domain registration prices well below the main competitors prices such as 123 Reg and Godaddy with regular fixed term promotions offering .Com domain registration prices at £5.99 for 1 year and .EU at only £2.99 for 1 year registration. Expect More Promotions Like This in 2012! Even with Registry price increases for .Com and .NET due on January 15th E Shop Hosts are not increasing the domain registration, transfer or renewal prices until January 31st!! 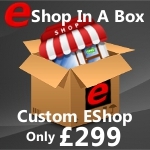 During 2011 Our most popular product/service was the E Shop In A Box package and we ended the year by creating just over 150 new E Shops for clients with five in the pipeline for early January web site launches, which works out on average to be one E Shop launched every three days. With new staff coming on board in January to increase our capacity our aim is to have created 250 new E Shops by the end of 2012. To every one that has posted on Facebook or Tweeted good things about our levels of Support A Big Thank You! We aim to continue and improve our hosting and e-shop set up support so any suggestions and feedback is welcome. The internet continues to evolve and the way ecommerce web hosting services like the ones that E Shop Hosts offer need to adapt to cater for clients needs and requirements, which is why we are rolling out Unlimited Web Hosting Packages, which offer our clients so much more flexibility and potential to have unlimited domains hosted and unlimited web space as well as unlimited bandwidth. On a final note, thank you again to all our clients for your valued business, it’s a privilege and we hope all of you will have a great and prosperous 2012! Hi there. Very cool site!! Guy .. Excellent .. Amazing .. I will bookmark your website and take the feeds also…I am glad to find numerous helpful info right here within the article. Thank you for sharing..